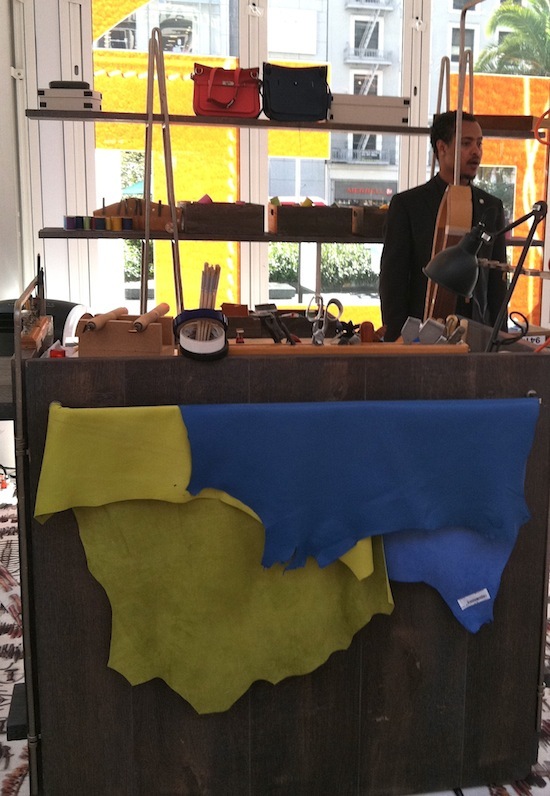 These photos from the 'Festival des Métiers' event in San Francisco were sent to me by 'Lady B', who generously allowed me to share them here. 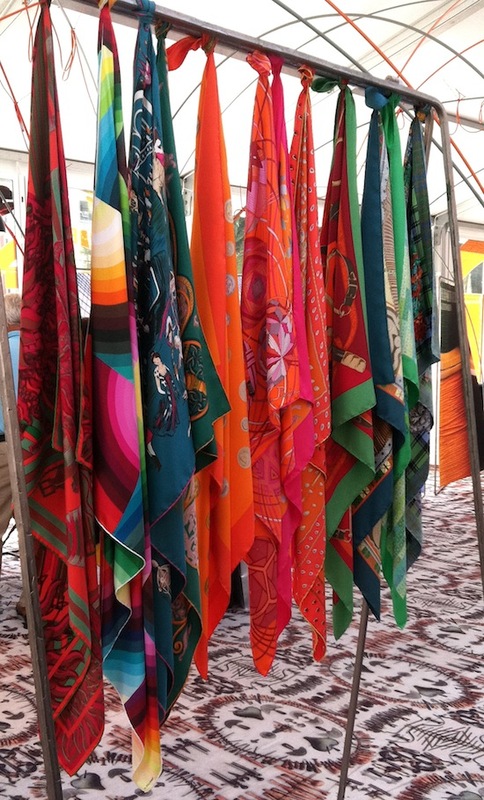 The 'FdM' is a travelling exhibion, where artisans from Hermès in France demonstrate on several work stations the process of screen printing silk, and then turning it into scarves and ties, stiching saddles, bags and small leather goods and gilding crystal. On my way back home to Los Angeles, I drove through San Francisco to see the Metiers des Artisans (Festival of Crafts) Exhibit in Union Square. It did not disappoint, although I do regret I had not allocated at least a half day so I could hear the full presentations given at each of the stations. 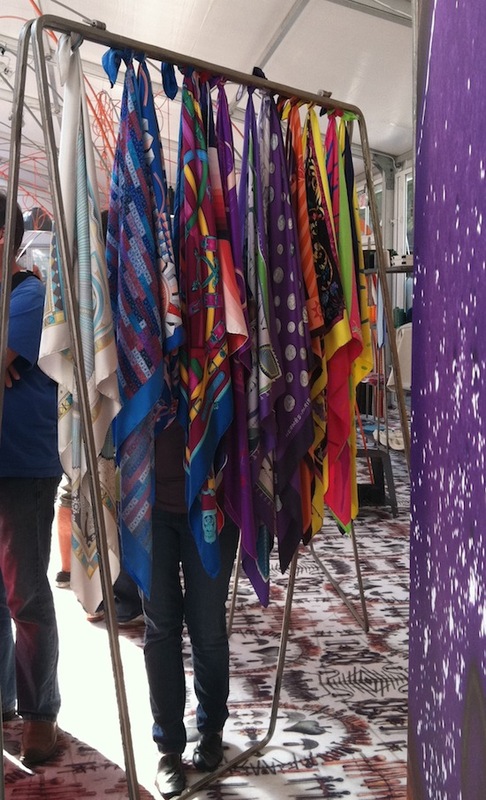 While there were eight in total, I was most drawn to those of the scarves and handbags. Luckily for me, a presentation at the scarf station began shortly after my arrival. 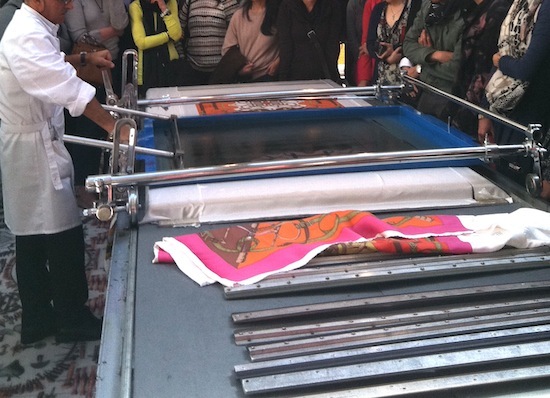 At the scarf printing station we watched the process of silkscreening a scarf. 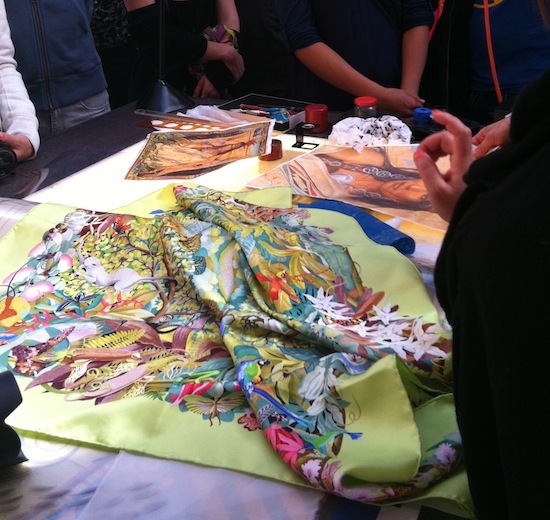 We learned that while artists design the initial image for each scarf, Hermes artisans engrave each of the silk screens by hand before the scarves are printed. A different screen is used for every color and some scarves have almost fifty (49 is the most to date!) colors. For example, the Kermit Oliver scarf, "L'Indien," sometimes also referred to as "Pani la Shar Pawnee," includes 36 colors (11 alone are in the skin tones), so requires 36 screens. The screens are individually placed and manually aligned over a sheet of silk twill. The colors are all custom created in house. After the printing, the scarves are hung to air dry. They are then steamed to hold the color. The scarves are washed with special soap and groundwater to smooth and soften them from the initial color application and coated with a protective finish. 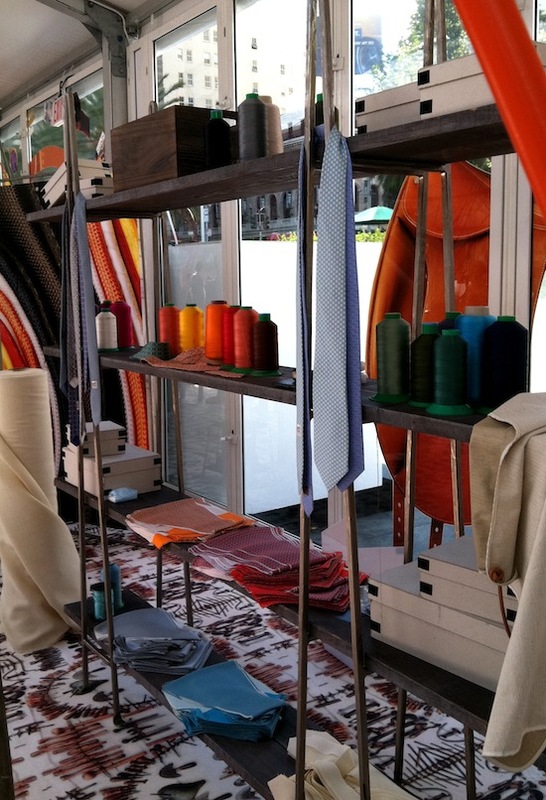 Finally, the scarves are hand-rolled and hand-hemmed along the edges by Hermes artisans. The entire scarf design process takes up to two years. 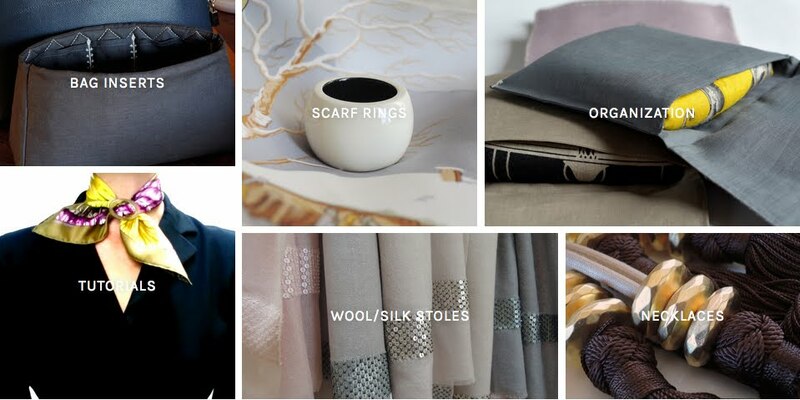 Every single step of the scarf making process is overseen and done by Hermes - from raising their own silkworms to producing their own twills (which are heavier and have a velour-like coat). 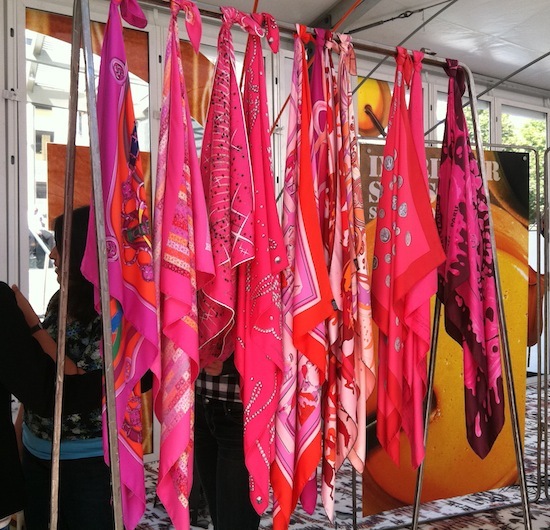 There were several racks of luscious scarves to admire and touch...the exhibit was designed to invite closer examination and interaction with the many different items produced by Hermes. At the handbag station, Jypsiere handbags were being made. We were told it can take thirty hours to make a single handbag, of which three might be made in a week, hence the long wait for some of the most iconic bags such as the Birkin and Kelly. Each logo is embossed by hand and different weights of leather are selected and used for different parts of every Hermes bag. Each piece of leather is meticulously cut and measured. 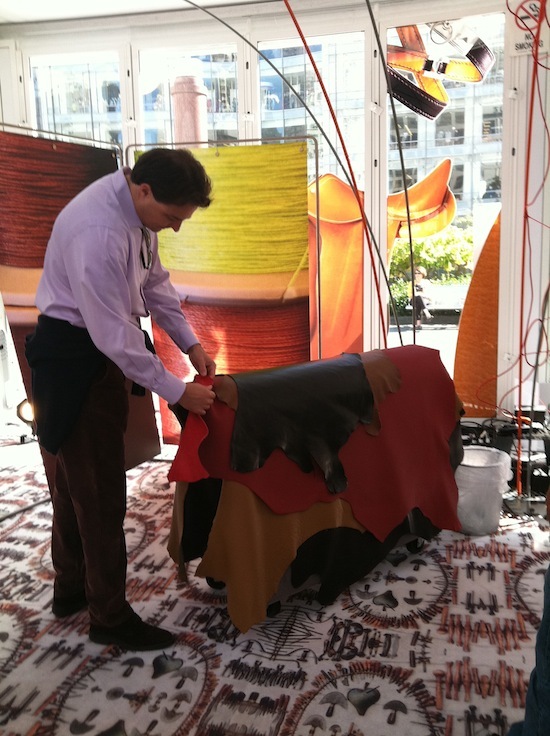 The leather samples on display were just sumptuous! The ties and many garments are made with the same silk used for the scarves and are rolled, folded and stitched with the same care and attention to detail. 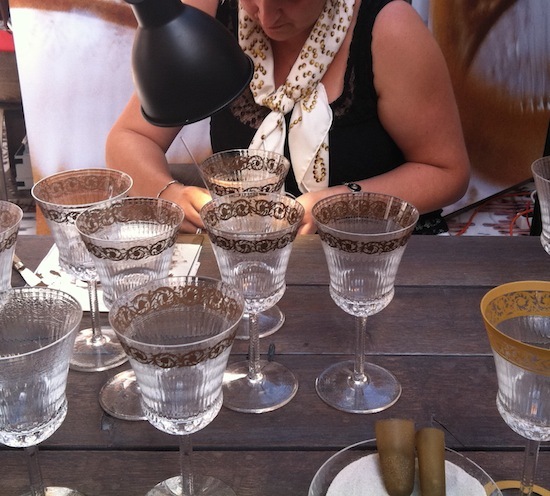 Real gold is used to paint the designs on the crystal glasses. As the color changes with the heat of the oven, the gold is later buffed by hand to give it the luscious shiny effect you see in the finished product. Aside from wishing I had been able to spend more time at each station, rumor had it there would be some unique items available for purchase at these traveling exhibits only, but this was not so. That said, the exhibit was terrific and is a brilliant idea in terms of introducing new prospective customers to the brand and further tantalizing those of us who are already avid fans and collectors. If the exhibit comes to a city near you, I highly recommend stopping by and having a look. It will be in Houston, Texas next from October 10-14th, 2012. 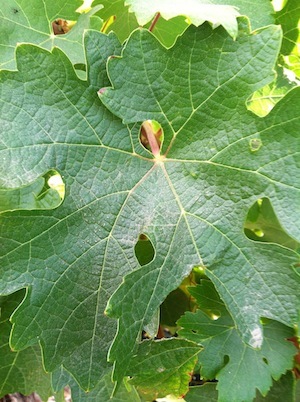 Thank you so much for taking us on a trip from Napa Valley to Hermès' wonder world of tradition, knowledge and craftsmanship, dear Lady B. I so very much enjoyed the fabulous photos of the event, and your insightful report. Mille merci! Woohoo, packing my bags as we speak!! 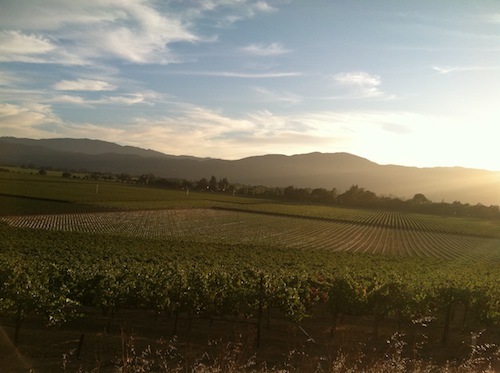 Perhaps we can add a little wine tour through Napa to the itinary? I've never been this time of year, it must be magical.. I edited the post to add Lady B's report, hope you'll enjoy the extra details too! I'll be in Houston to see the Festival. 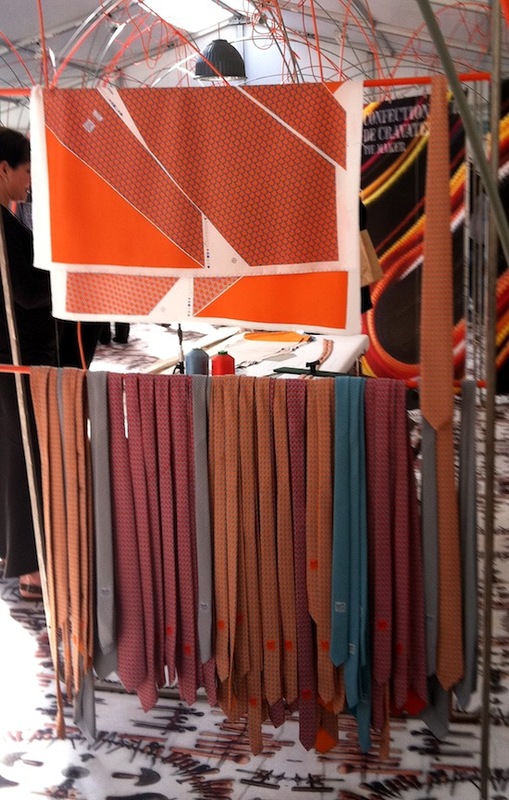 I am so excited to be able to see Hermes craftspeople in person. Thank you for posting these pictures. Thank you for sharing your experience, dear Becky! How amazing it must have been to watch the diamond setter at work. Congratulations on your H goodies, there could not be a better souvenir to remember the event than orange boxes. Which scarf did you bring home? Thank you for sharing....which is the scarf in the final scarf photo with the pale green border? So pretty!! Thank you for satisfying my curiosity, dear Becky :-) What a perfect choice for a black and white wardrobe, congratulations again! Love these photos....I am thinking of attending the Houston show and wonder if they will sell any of these 'specially' made scarves? While the scarf may not be completely processed, how delightful to have one made while we wait! Does anyone know if it is just a show or are some items available for purchase? Any special items available? Hope you can make it to the Houston show. I agree, it would be great fun to own a scarf one has seen in the making! But, as Becky said below, H does not sell unfinished or less than perfect items. I have not heard of any special items available on these shows, but hopefully the local boutique will be well stocked! Many thanks for chiming in, dear Becky! So glad you could answer some of the questions before I did :-) Great news re the Houston flagship, I can think of a few ladies who would get excited about this! Does anyone know if this is an annual event? 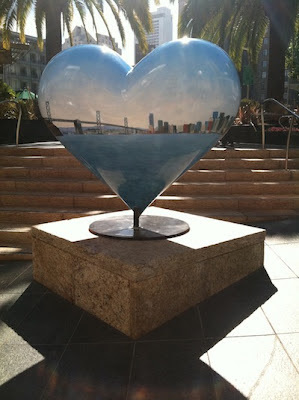 It came to my city and I missed it which is a shame as it looks really very interesting. Thank you for the photographs. No, it's sadly not an annual event. Smaller demonstrations are held in the boutiques every couple of years, but they are usually by invitation only. 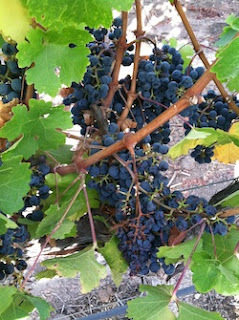 Thank you and Lady B for sharing these wonderful photos! I am lucky that I am within walking distance of Union Square and was at the event on the opening morning. 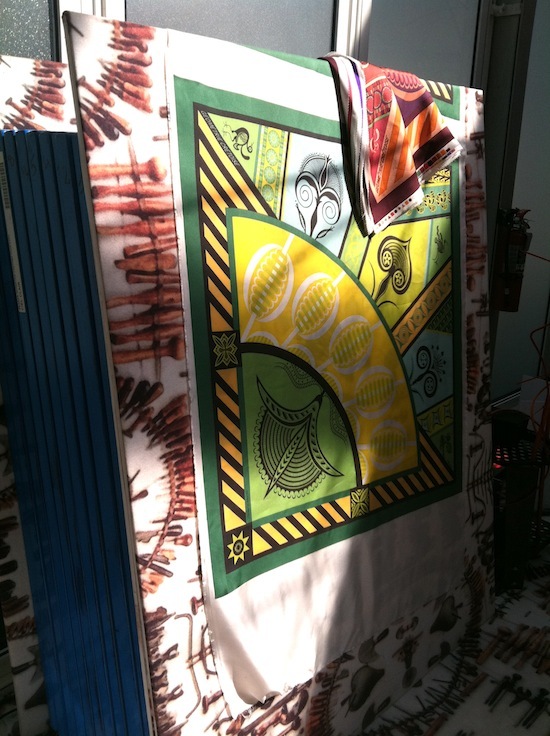 I watched the scarf printing demonstration from start to finish and now appreciate my scarves that much more. Sadly, I didn't bring my camera, assuming that photos wouldn't be allowed, so I really appreciate Lady B recording the event. Thank you for sharing your experience, dear Kelly. 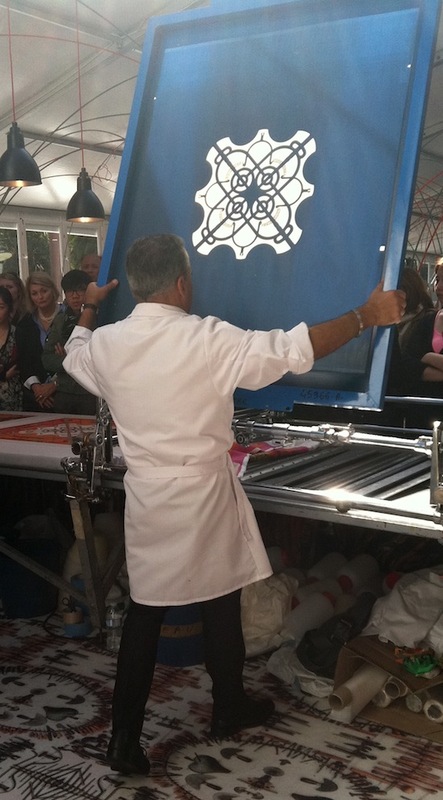 How lucky to have watched the scarf printing demo! It was my pleasure to share my experience at the Union Square FdM event and am delighted you are enjoying the pictures. Thanks to you all for the kind feedback. MaiTai - your contest idea is simply marvelous! Thanks so much again for the joy you brought to so many, dear Lady B. Your reportage and pics have been such a wonderful treat. Mille merci!